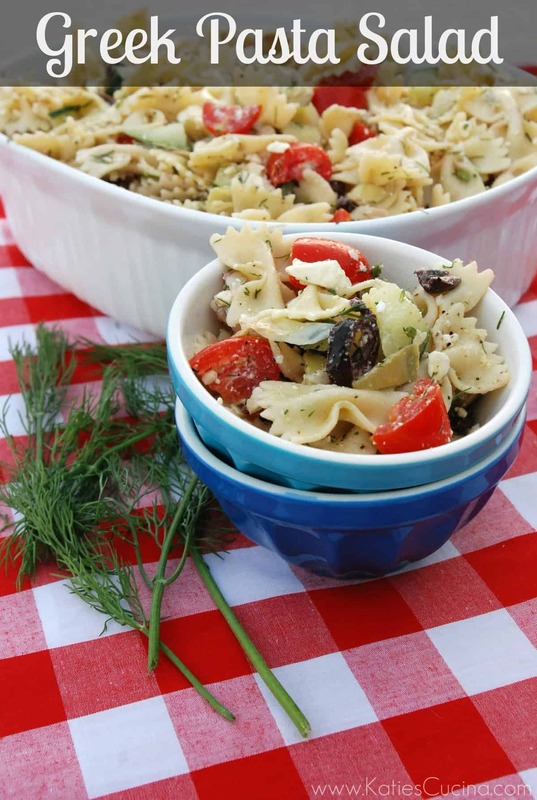 I love a quick and easy (and of course very tasty) pasta salad. I also like when they aren’t chocked full of mayonaise. I had this recipe idea in my head for a while now and finally brought this Greek-style pasta salad to life! Granted, it does contain cheese that has to be refrigerated, but its just as fabulous to bring to an upcoming bbq. I developed an entire Greek menu all dedicated to bbqing since we are unofficially celebrating the last week of summer before Labor day. So stay tuned all week because by Friday I’ll have an entire menu for you to wow your friends and family this Labor day weekend! Pair the Greek Pasta Salad with Grilled Greek Chicken Strips and Grilled Greek Corn on the Cob for a complete Greek inspired meal! Cook pasta according to package, drain, rinse with cold water, and set aside. Meanwhile in a large bowl (or container) add halved grape tomatoes, diced cucumber, feta, sliced kalamata olives, red onion, and artichoke hearts together. In a small bowl add 1/4 cup canola oil and Greek seasoning together--mix well until well combined. Add pasta to bowl and begin mixing the vegetables and cheese with the pasta. Once the pasta and vegetables are partially combined proceed to pour the oil/seasoning mix over the pasta. Mix well until everything is well incorporated. Serve immediately or refrigerate up to 3 days. *After refrigerating the salad the oil tended to stick to the pasta. Feel free to let the pasta salad sit out for a good 15 minutes, mix well and if need be add a little more oil and Greek seasoning. **my neighbor added peperocinis to this and said it was phenomenal. Fun idea for the week, this looks and sounds amazing. It’s hard to believe summer is coming to a close!! Cathy–I know! I’m totally going against the grain with non-American (hot dogs and hamburgers for Labor Day this year). Thankfully, Summer in florida won’t be really gone for another few months but it makes it hard to start making all the fall foods when it is still 90 degrees outside! I don’t like mayonnaise but i DO love pasta salad, so this recipe is just perfect for me. looks absolutely amazing! I agree Amy–very few things I can eat mayonnaise with. Pasta salad just doesn’t seem to be one of them! This dish would be perfect for lunch, I thank you for sharing! Julie, you’ll love this then! My mom used to always make this for parties. Love love love it. Very cool–the same way with the greek seasoning and oil? Not exactly the same. Actually she has never divulged her technique… but I am definitely trying it this way! I love it! Hopefully its close to how she makes hers! wow!this is an innovative salad! you are right about mayo though, I’m too not fond of very slushy kind of salad. This is perfect. You just can’t go wrong with greek flavors in my opinion! Great pasta salad! This is so perfect for the pending holiday weekend! Love this recipe, except is there a way to sub greek feta for something milder?! I know, I am weird just like that. 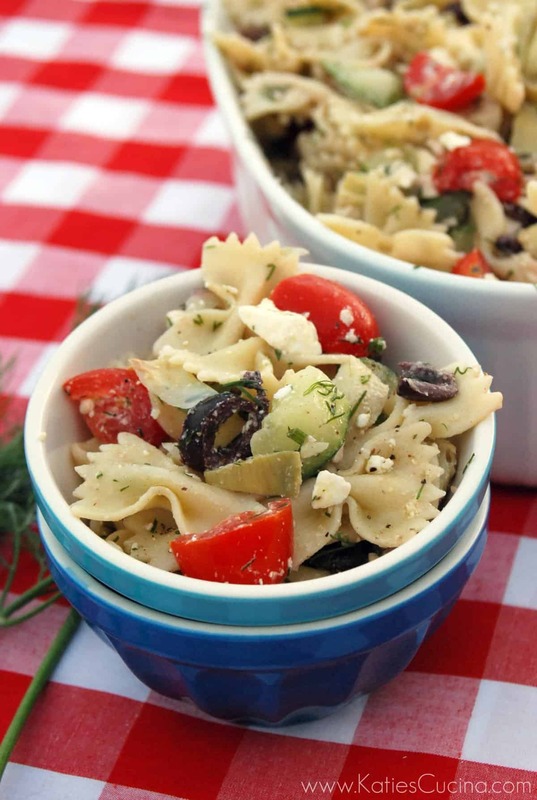 Love Greek Pasta Salad – so refreshing – & this recipe looks easy & tasty! Thank’s ! I love this recipe & it travels well for pot lucks!